We were in Paris. This city that draws us back again and again. How we love it and how very quickly it envelops us in its magic. We had driven to Paris from Montreux in Switzerland. This would be our last port of call on our European odyssey. Accompany us on a joyous ride as we revisit some special favourites. Be there as we discover new delights to add to our burgeoning treasure trove of Parisian experiences. We'd love to share all this with you. Do contact me at Back Chat at http://www.leslieback.co.za or email me at les@leslieback.co.za to find out anything you need to know about our favourite place on earth. The journey to our spiritual heartland had been eventful and exciting. We had driven through the 11.6 kilometre Mont Blanc tunnel, a road tunnel under the Mont Blanc Mountain. Imagine, driving under a mountain! But the biggest adventure lay ahead. The challenge of the Etoile. Anyone other than a French person who has driven around the Etoile and has survived mentally and physically unscathed, will realise that they have accomplished the nigh impossible. 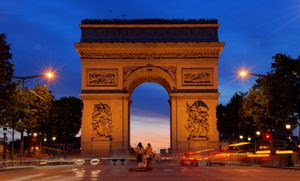 The world’s largest triumphal arch, the Arc de Triomphe de l’Etoile, is at the centre of a star-shaped configuration of 12 radiating avenues. Parisians drive hell for leather around the Etoile. There are rules that have somehow prevented total carnage and the French know the rules and are comfortable with them. But pity the poor stranger yet to learn the perils of that place. There is a rule that says that any car can cut in from their left. Trouble is that if you are on their left and do not expect this intrusion into your driving lane, all sorts of mayhem follows. Hooting, lots and lots of hooting, gesticulating hands letting you know exactly what they think of you and your driving and then they zoom off, leaving you, shaken and quite destroyed, in their wake. Eugene, white-knuckled and with steely determination gripped the steering wheel. I gave up. At a dazzling speed we drove around the Etoile until we reached the Avenue des Champs- Elysèes. We turned into this ‘most beautiful avenue in the world’, convinced that we had escaped Dante’s Inferno. We had become ‘citizens of the world’. We had driven around the Etoile! Down the tree-lined Avenue, left into Rue du Colisèe, left again into Rue de Ponthieu and then right into Rue St Philippe-du-Roule and voila, we reached our hotel, Hotel Bradford Elysèes. We had stayed in this hotel many times on previous trips to Paris and felt very much at home there. Eugene deposited me and the suitcases and then departed to return the car to the rental firm. He would deal with the traffic and all the one-way streets without me. Probably a good idea. First, a warm Gallic welcome from our hosts and then with suitcases crammed into the quaint glass and brass lift, it was upstairs to our favourite room on the first floor. It is always such a comfort and a pleasure to settle into a familiar room. Paris embraced us. A cornucopia of delights waiting to be revisited. Oh the wonder of it all! It was a glorious spring evening and the Champs Elysèes, the boulevard of all boulevards was just around the corner. These South African boulevardiers were ready to join the locals. But first, we made a dinner reservation for 9.30pm. A famous restaurant, Le Boeuf Sur Le Toit at 34 Rue du Colisèe, is a few minutes’ walk from the hotel. We then set off on our stroll along the Champs Elysèes. Of course we had dressed for the outing. Who in their right minds would boulevard in Paris unfashionably dressed? We strolled up to the Arch and to the Monument to the Unknown Soldier. Its flame commemorates the dead of two world wars and is rekindled every evening at 6.30. A moment to pause and to reflect and then onwards down the other side of the avenue. People sat at side-walk cafés contemplating the passing show. We wandered on, delighted to be part of that passing show. Eating at Boeuf sur le Toit is rather like going to the theatre. Everybody is fashionably dressed and watching everyone else. One enters this beautiful Art Deco restaurant through an arch with the name emblazoned above it. Through a marble hall with mountains of seafood displayed on crushed ice and then into the first of several dining halls. One is greeted by the sight of a huge mahogany bar with beautiful people sipping drinks while waiting for a table. There are towering engraved mirrors, spectacular chandeliers and all the accoutrements of the Art Deco period. Our coats were taken by a concierge as we drifted towards the bar. We ordered an aperitif and waited for our table. Now we could watch the watchers. Crowd watching is a great spectator sport in Paris. We were eventually shown to our table, a cosy banquette below a picture of Coco Chanel. In the 1940’s, the restaurant was frequented by the likes of Pablo Picasso, Coco Chanel and Maurice Chevalier. Today, businessmen rub shoulders with the beau monde and the occasional film star. That evening at Boeuf Sur le Toit, we did Lucullus proud. I had a dozen Bellon oysters to start and Eugene, a bowl of mussels in wine and garlic. We ordered a bottle of French Champagne to wash down the molluscs. In France, French Champagne is local champagne. Utter bliss! We then shared a seafood platter as a main course. The oysters were served on piles of crushed ice and accompanied by shallot vinegar and lemon wedges. The seafood platter was a feast for the eyes and the stomach. Succulent prawns and langoustines that we enjoyed with crisp dry white house wine. All this may appear to cost the equivalent of the National Debt, but it is much more manageable than one might presume. There are all sorts of different menu options and prices, and the locals certainly take full advantage of these. We love walking in Paris. It is part of the Parisian experience for us. We take the metro when necessary, but for the rest we walk and walk. Whenever possible, we avoid taking taxis. French taxi drivers are a law unto themselves. A favourite ploy is to pretend to know no English and to defy one to explain oneself in French and then to be incredibly snooty about a foreign pronunciation. Oh, and no guarantee that the shortest distance between two points is a straight line! We call it the ‘scenic route’ when we realise that we are quite literally being taken for a ride. Planning outings is always marvellous fun. A destination is decided upon and a route chosen always with a favourite eating place somewhere on the way. We planned a day’s outing to the Centre Georges Pompidou and to the Musèe d’Orsay. The Centre Georges Pompidou is known locally as Beaubourg. 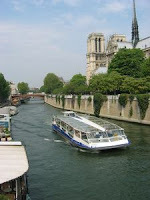 This is because of its location in the Beaubourg in the 4th arrondisement of Paris. We love this rather eccentric museum. It is a sort of inside-out building. All the structural fundamentals are on the outside of the building enclosed in bright colour coded pipes. So there is a riot of blue, green and yellow and red pipes criss-crossing the façade. Outside in the Place Georges Pompidou, street performers ply their trade. Today we planned to visit an exhibition of work by Andy Warhol at the Beaubourg. The Musèe d’Orsay, on the Left Bank, just across the Seine, is a converted Victorian railway station. It houses many treasures, but for us the highlights are the impressionist and post-impressionist works. We planned to walk along the Champs Elysèe away from the Arch and in the direction of the Place Vendôme and the Rue de Rivoli. 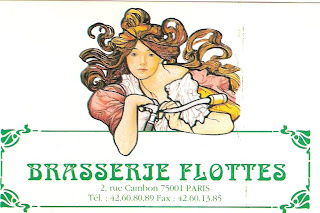 A favourite brasserie, Brasserie Flottes, situated at 2 rue Cambon, between the Place Vendôme and the Faubourg Saint-Honoré, would be our stop for lunch. We set out on our day with excited anticipation and delight. We passed Brasserie Flottes on our way to the Beaubourg. The museum was, as usual, teeming with people, but one never feels crowded there because its wonderfully large spaces effortlessly absorb large numbers of people. The escalators, on the side of the building, are encased in glass, and one has amazing views of Paris that become more spectacular the higher one goes. We always view Andy Warhol’s work with amazement and puzzlement. Amazement at the wonderful silkscreen images of Marilyn Monroe and other 60’s icons and puzzlement at arrangements of Campbell soup cans. The unconventional nature of his work fits in so well with the eccentric ambience of the Beaubourg. As with all the great art museums that we return to from time to time, we spent time revisiting favourite works that have become like old friends. It is always reassuring to find them and once again stand and wonder at their beauty. Outside in the Place George Pompidou, we paused to watch a fire-eater in action and then retraced our steps to Brasserie Flottes. Brasserie Flottes has a café/brasserie formula which is most convenient. One can enjoy a larger meal, or just have a salad or a sandwich. Their croque-monsieur sandwich is perfection. That day Eugene enjoyed herring fillets on boiled new potatoes and I had a luscious tomato and Mozarella salad and a side dish of Aligot. The Flottes family come from the Auvergne region of France and they have introduced some of the specialities of that area into their brasserie. Aligot is a dish made from potatoes, garlic and Cantal cheese. It is utterly delicious! Chez Flottes has an elegant ambience with marble topped tables and a long, moulded zinc bar. Some sit on the wicker chairs and others prefer a seat at the bar. There are wood panels and stained-glass windows. But it can be as formal or as informal as you like. Chic Parisians mix happily with casually dressed visitors. The waiters have been there forever and greet one as old friends. Eugene enjoys a glass of Stella Artois beer at lunchtime and I generally have a glass of house wine. It is amazing how much more alcohol one’s system can tolerate whilst on a holiday in France. We bade our hosts au revoir and set out for the Musée d’Orsay. It is a short distance up to the Rue de Rivoli and then through the Jardin de Tuilleries to the Quai Tuilleries. A wooden bridge takes one across the Seine to that most beautiful building. We made our way through the throngs of visitors and into the visual splendour that the inside of the gallery presents. Great glass-domed vaulted ceilings dwarf the mere mortals scurrying around below on the marble floors. 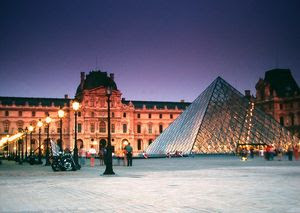 Many of the exhibits that are now housed in the Musée d’Orsay originally came from the Louvre. The superb collection of Impressionists that was housed in the Jeu de Paume is now housed here too. It is that collection that draws us back time after time. Renoir, Degas, Gauguin, Van Gogh, Cezanne, Pissarro, Sisley, Monet, is there any end to the wonders that lie in wait. We play a little game every time we are in this amazing place. We search for’ Whistler’s Mother.’ Gallery personnel constantly move things about and finding a special favourite again is rather like a treasure hunt. At the far end of the lower hall is a complete model of Paris under a glass floor. It is amazing to see all the avenues and buildings in perfect scale replicas. Wandering through the halls, one comes across all sorts of remarkable things. There is a huge room with wonderful chandeliers and mirrored walls. Dummies are in period costume giving the appearance of a ballroom from another era with the dancers frozen in time. The only reason we ever leave the Musée is because we are exhausted. We drag ourselves away and limp back to the hotel. In Paris, time is always a precious commodity. In the short time that was left, we reacquainted ourselves with old favourites and discovered some new gems. The area around the Madeleine and the Opera is busy and beautiful. A marvellous place to visit is Fauchon at 26 Place de la Madeleine. Fauchon is a happening. It is one of those speciality shops that defy categorisation. This elegant shop stocks the most beautiful and expensive delicacies in all Paris. Exquisite and exotic fruits, beautifully packaged chocolates, pastries that are works of art, coffee, tea, charcuterie and a huge collection of fresh and packaged goods. Buying a gift for someone from Fauchon ensures an extravagant and fulsome response. Our French cousins thank us vociferously whenever we bring them a ‘cadeau’ from Fauchon. We enjoyed a cup of coffee and a pastry at the tea salon. Half the fun is choosing the pastry. A quirky little piece of French eccentricity. There is an organ grinder that plies his trade in that vicinity. He doesn’t have an organ-grinder’s monkey. 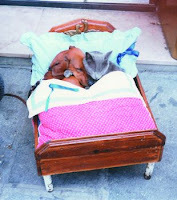 He has a small dog and a large cat that he places, wrapped in a patchwork quilt, in a miniature wooden cradle. The animals lie there quite peacefully and allow people to pet them. I think that they probably had enough of me petting and fussing over them and pretended to be asleep whenever I appeared. The organ-grinder was delighted to make a tidy sum from my frequent visits. The Musée de l’Orangerie in the Tuilleries Gardens with rooms where Monet’s giant paintings of water lilies line the walls is a special favourite. One can sit in the middle of the room and just drown in the beauty of those flowers. We decided that it was time to visit his home to see where he had actually created these works. The Japanese garden at Giverny is exactly as one would have imagined it would be. There are the small wooden bridges that he painted and the graceful weeping willows gently caressing the water; and of course the water lilies, as beautiful and serene as they were when he captured their images on canvas. It is always a joy to visit the Left Bank. We take the metro and emerge next to a famous café Aux Deux Magots at 170 Boulevard Saint-Germain des Prés. What an excellent place to sit and have a steaming cup of good hot chocolate or a coffee still served in the thick white cups that they have used ever since the restaurant first opened. The passing show is quite extraordinary, a mixture of radical chic and downright weirdness. It is the history of the cafés on the Left Bank that excites and intrigues. Intellectuals such as Jean Paul Sartre and Simone de Beauvoir met there. Ernest Hemingway, one of my favourite authors, was a regular patron. Imagine listening to him reading aloud the poetry he had written and hearing him talk about the wars that he had covered as a correspondent. Those were glory days in Paris, when poor artists, writers and intellectuals, who for the price of a coffee, could sit there all day, talking and working. There are not enough hours in the day to thoroughly experience all the delights of the Left Bank. The markets with astonishing displays of all types of food and produce are a vision of colour. The sight of a Parisian housewife searching for the perfect tomato, or piece of meat or fish for the meal she will cook that day is a lesson in concentration and patience. Never ever, second best. Wonderful boutiques selling art and artefacts nestle in the side streets and on the main thoroughfares are the great couture houses. Unlike Montreux, where people hide their wealth, the French flaunt it and seeing women exquisitely dressed and coiffured is one of the joys of people-watching. When it comes to lunchtime, there is an incredible array of places from which to choose. Sometimes we enjoy a light lunch at one of the many famous cafés, but that day we chose an old favourite, Chez Maître Paul at 12 Rue Monsieur-le-Prince. He has specialities from the Jura region and we both adore his cumin-flaked sausages served with pommes à l’huile, potatoes served with oil and vinegar. We shared a carafe of wine and mopped up the sauce of the potatoes with wonderful chunks of fresh baguette. No other baguette ever tastes quite like the baguettes that one eats in France. At the end of a long day, another metro back to the Right Bank, and as ever conflicted feelings as to which side of the Seine is more beautiful. Time had run out. We had to leave our beloved Paris. We always leave part of our hearts behind to be retrieved when next we return. Au revoir Paris, à la prochaine fois.